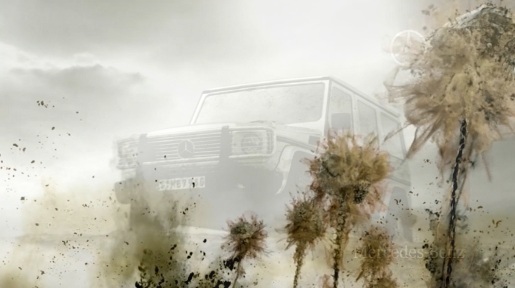 Mercedes Benz celebrated thirty years of the G Class in 2009 with a television commercial featuring digital fireworks of mud. Production of the Geländewagen Cross Country Vehicle (G-Wagen or G-Class) began in 1979 in response to a request for a military vehicle from the Shah of Iran, a major shareholder in Daimler-Benz. Mercedes launched two new models for the thirtieth anniversary, the 2009 G500 and G55 AMG. The Fireworks concept was developed at Jung von Matt/Alster Werbeagentur by executive creative directors Deneke von Weltzien and Armin Jochum, creative director Thimoteus Wagner, art director Jonas Keller, copywriter Daniel Pieracci, agency producers Meike van Meegen and Vanessa Fischbeck, account supervisors Christian Hupertz, Yves Rosengart, Alexander Kerkow, Maria Groh. Filming/animation was shot by DMDA director Dirk Urbaniak via Markenfilm, Hamburg, with producer Frauke Weisheit and director of photography Michael Goljanek. Music for the Royal Fireworks was composed by Georg Friedrich Händel in 1749 under contract of George II of Great Britain for the fireworks in London’s Green Park, celebrating the end of the War of the Austrian Succession. Post production was done at Infected by producers Henrik von Müller and Julian Büchner, sound designer Mikis Meyer, Flame artists Dirk Urbaniak and Niko Papoutsis (Digital Straik), 3D artist Christian Keller, Tim Borgmann (freelancer), special effects artists Mathea van Kann, Eddie Dregis and Richard Stanley.